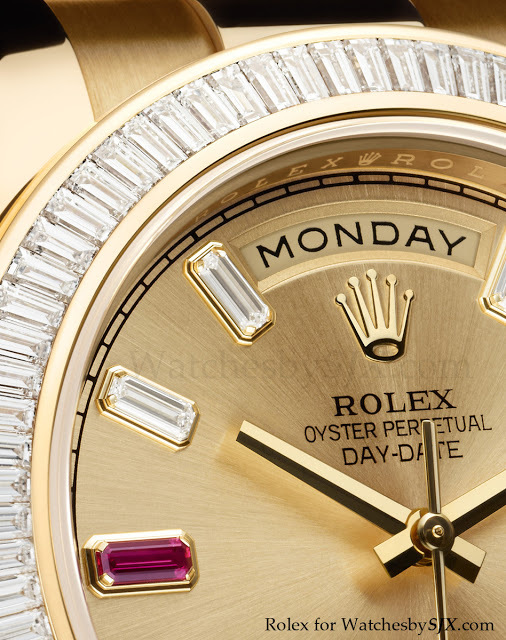 For a detour beyond technically minded horology, look no further than Rolex. 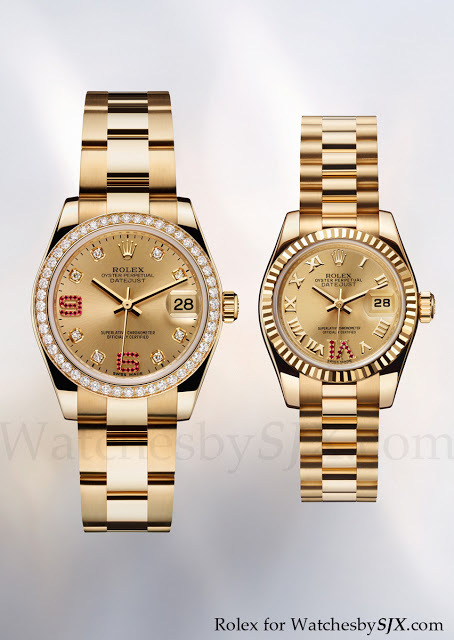 Beyond the usual so-called professional watches like the ceramic Submariner no-date, or even the new Sky-Dweller annual calendar, Rolex always has lots of bling, in the peculiar Rolex style, to show at Baselworld. And so it was this year. Before you judge these watches, remember that they all have entirely in-house movements with free-sprung, adjustable mass balance and proprietary alloy hairspring formed into a Breguet overcoil. While that is entiely true, I write it semi-seriously; the aesthetic is for a very specific clientele. 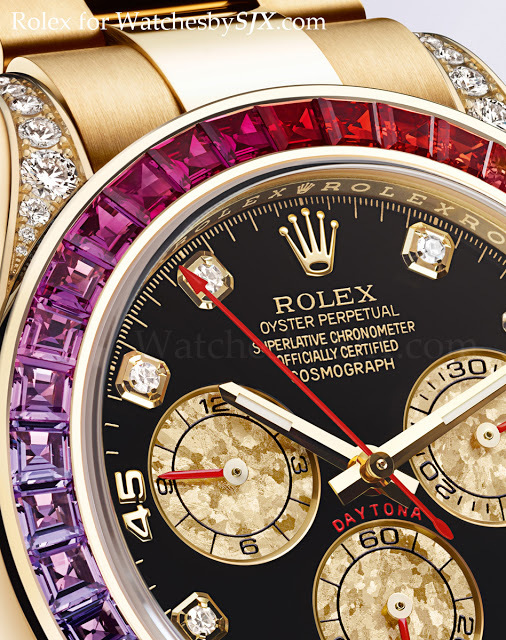 The flagship is probably the Daytona Cosmograph “Rainbow” (ref. 116598 RBOW). 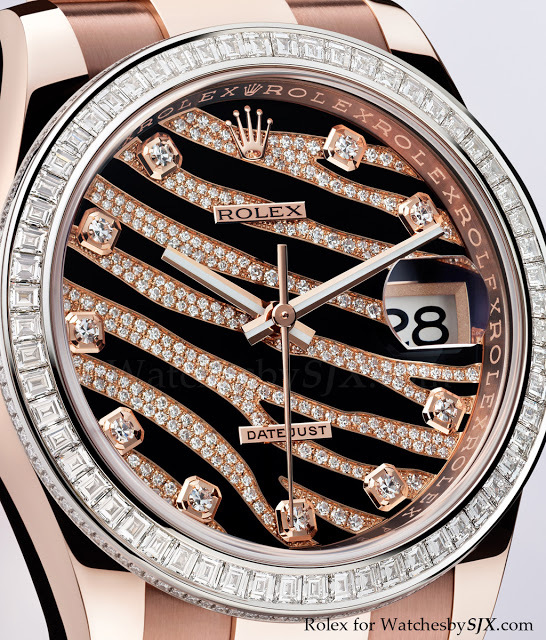 That’s because bezel is set with baguette-cut sapphires forming a rainbow pattern (no kidding). 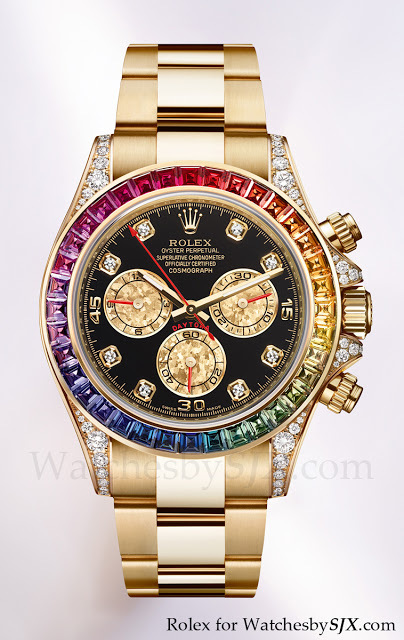 But interestingly the chronograph sub-dials are made with a proprietary Rolex 18k gold alloy called Gold Crystals which resembles meteorite. 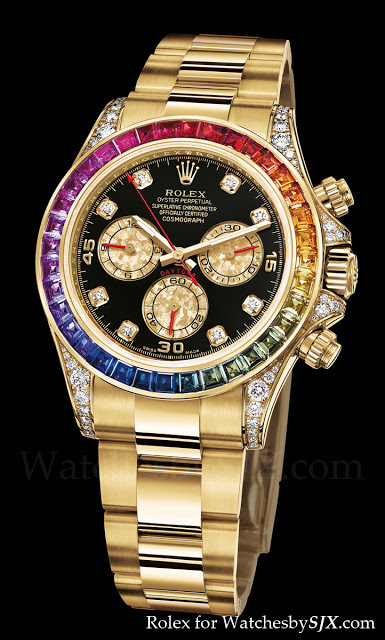 This is also available in white gold, for a more discreet look. 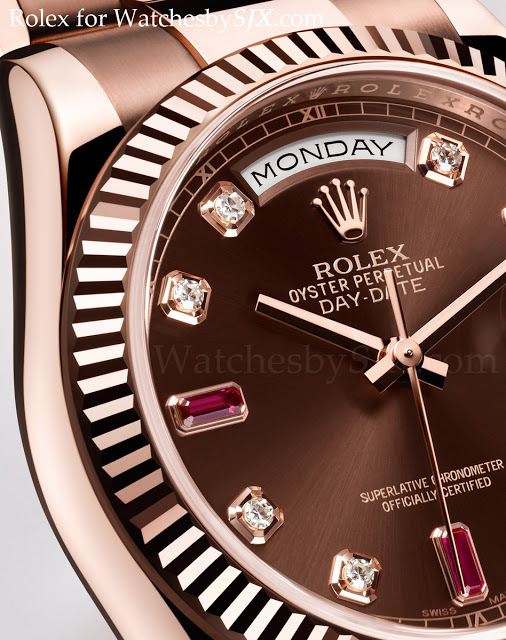 The retail price is USD89,100 and availability is limited due to the difficulty of matching the coloured gemstones..
And then there’s the Day Date 36 mm in Everose with chocolate dial, diamonds and rubies for indices (ref. 118235). Ho hum. 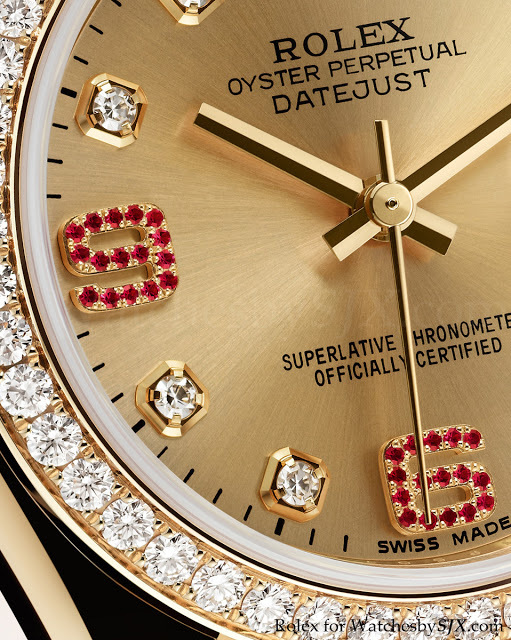 The 41 mm Day Date II is available with baguette set diamond bezel, along with diamonds and ruby markers (ref. 218398). 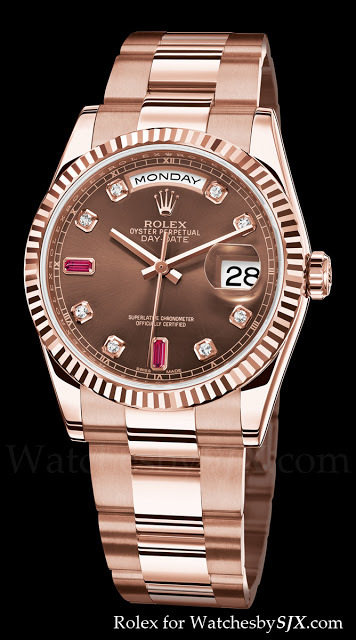 A few decades ago this would have been the watch of choice for a third world dictator to match the black Mercedes S-Class but now there are so many more choices, in watches and cars. 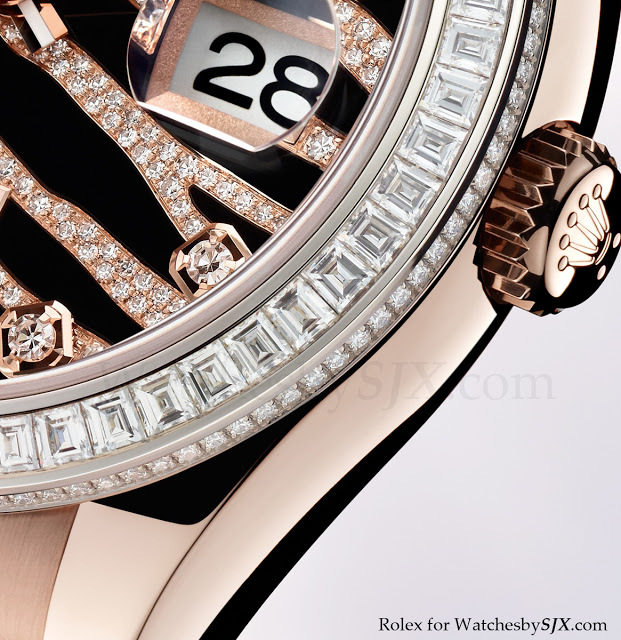 Ladies can get something similar with the Lady Datejust in 31 mm (ref. 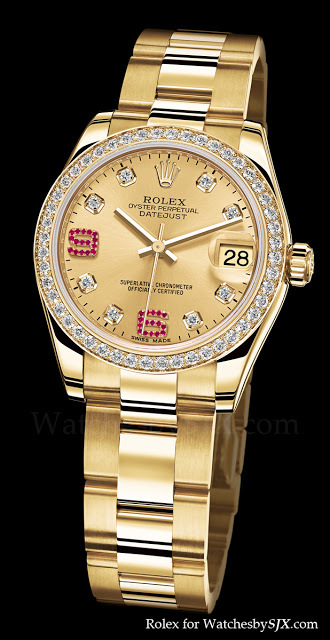 178288) or 26 mm (ref. 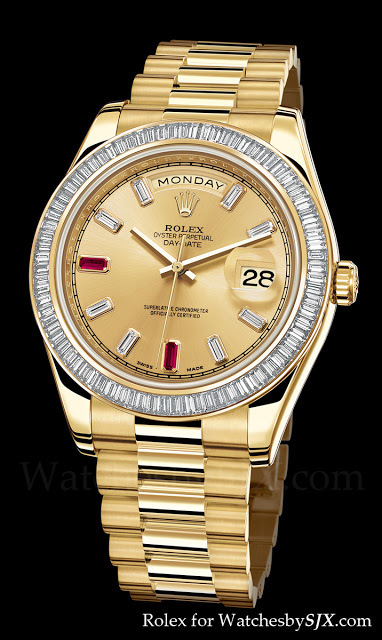 179178) cases in yellow gold. 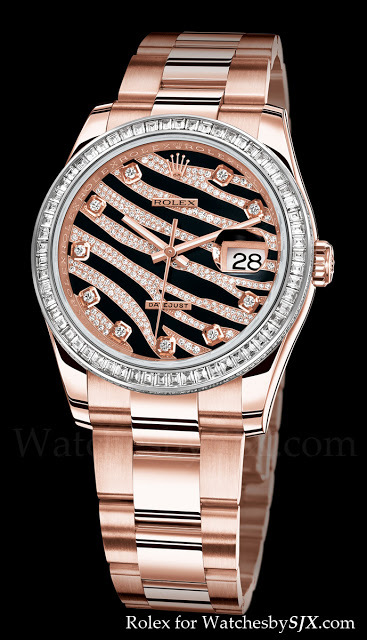 Lastly the 36 mm Datejust is available in Everose with Zebra dial in diamonds and black lacquer (ref. 116285).